A poorly exfoliated scalp can lead to limp and oily hair. Scalp exfoliation prevents a variety of scalp conditions, such as acne and dandruff. Scrubs can be purchased at most beauty retailers or made from scratch at home. You shampoo and condition your hair. You avoid hairsprays and other heavy products. You even try to eat hair-healthy foods like spinach and eggs. Despite all this, you still may not be doing enough for your head. Too often, people focus on their hair and ignore the skin beneath it. The scalp can be a woefully underappreciated and undertreated part of the body. Leaving your scalp to fend for itself can be bad for both your hair and your overall health. Thankfully, scalp exfoliation is a simple and affordable way to help keep your scalp clean and healthy. Exfoliation is the process by which old skin cells and oils are removed from the surface of the skin, often using a coarse material. Scalp exfoliation is this same process applied to the skin beneath your hair. Just like any other part of your body, the scalp can suffer from a build-up of oils and dead skin cells. That build-up can in turn lead to a variety of skin conditions. Hair follicles produce an oil designed to waterproof and lubricate skin and hair. This oil, also known as sebum, comes from the sebaceous glands that connect to the hair follicles beneath the skin. As this oil is released, it collects dead skin cells along the way and flushes them out of the hair follicle. Sometimes, the oil and skin cells can then form a plug, blocking the hair follicle. Clogged hair follicles can lead to acne and inflammation. On the scalp they can also result in thinning hair and hair loss. Even when the hair follicles aren’t fully clogged, an overabundance of sebum leads to its own problems. Dandruff, clinically described as seborrheic dermatitis of the scalp, is believed to be caused by a fungus that thrives on sebum from the malassezia family, and it has been linked to oily build-up on the scalp. Oil build-up can also lead to oily, limp hair that appears dirty and unkempt. Some people experience the opposite problem. The dead skin cells that build up on their scalp due to dry skin or other skin conditions make the scalp itchy and irritated. Then scratching the scalp can lead to scabs and infection. Scalp exfoliation helps to prevent these conditions by removing oil and excess dead skin cells. It can also encourage cellular turnover, as new skin cell growth is promoted at the same time that the old skin cells are removed. Despite all of these benefits, there are some people who should avoid scalp exfoliation or consult with a dermatologist before trying it. If you have an existing skin condition that leaves your scalp sensitive, like psoriasis or eczema, then you don’t want to risk further irritation. » If you are experiencing scalp irritation or are unsure if you should be exfoliating, find a dermatologist near you for diagnosis and treatment. How do you effectively exfoliate your scalp with all that hair in the way? Most people use either an exfoliating brush or a hair scrub. Some people suggest doing both, starting with the brush. Others recommend doing only one to avoid overly-dry skin. If you do use an exfoliating brush, use it while your hair and skin are dry. Gently stroke the hair with the brush, staying close to the scalp. Avoid pressing too hard if you don’t want to irritate your skin. Remember that the goal is not to brush the hair, but to brush dead skin cells away from the scalp. When choosing an exfoliating brush, do not confuse brushes meant for the scalp with brushes meant for the face. There are brushes specifically designed for scalp exfoliation. Some people will also use a teasing brush for the same purpose. Before applying a hair scrub or exfoliating oil, be sure to read the directions. Some hair scrubs and oils work on dry hair, whereas others, like some of the at-home scrubs described below, require wet or damp hair. In either case, set aside five to ten minutes to massage the product onto your scalp. The product will get into your hair. That’s fine. But don’t waste product trying to lather your ends. When you’re finished with brushing, hair scrubs, or both, it’s time to wash your hair as normal to rinse away all of those loose skin cells. For best results, aim to repeat this process once or twice a month. The following scalp scrubs are some of the most popular on the market. Though each one is unique, it’s hard to go wrong with any of them. Available for only $9 at most retailers, this is the most affordable scalp scrub listed here. It’s sulfate-free, making it gentler than some of the other products available, and it uses crushed apricot as an exfoliating agent. 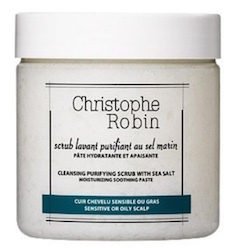 This is a pricier scalp scrub that acts as both a shampoo and exfoliator. It contains apple cider vinegar loaded with alpha hydroxy acid, a chemical which helps naturally exfoliate the scalp. It also contains peppermint oil, which is said to help with inflammation. This $42 scalp scrub is another two-in-one exfoliator and shampoo. 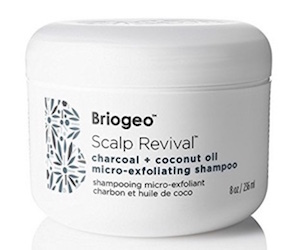 The charcoal in it absorbs oil and dry skin, while the coconut oil acts as a natural antibacterial and antifungal treatment, making this a good choice for those with dandruff. At $53, this is the most expensive scalp scrub listed here. It uses salt to exfoliate, which then dissolves as the scrub rinses out. In the meantime, sweet almond oil hydrates the skin. $20 from the Kiehl’s website, this scalp scrub is somewhat more affordable. 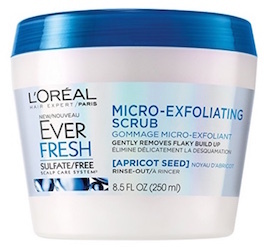 It exfoliates using apricot and argan, a natural anti-inflammatory ingredient. It claims to specifically target dandruff. When choosing the right scalp scrub for you, look for something lightweight that will wash out easily. Also consider your particular skincare needs, such as dandruff or itchy skin. The right scalp scrub for you will depend on your individual hair and skin type, as well as your personal preferences. If you’re not interested in paying for a scalp scrub online, or if you’re just a fan of DIY beauty, you can make your own scalp scrub from home. These recipes are fairly straightforward. Each scrub includes a hair product, a soothing agent, and an exfoliating agent. Mix the ingredients together and apply to wet hair. Massage for five to ten minutes, then wash your hair as normal. If you’d rather keep it all-natural and leave out the hair product, consider substituting honey for conditioner. If you find the scrubs too irritating, then try again with less of the exfoliating agent (sugar, baking soda, cornmeal). Finally, if you’re feeling creative, try coming up with your own recipe.